TUCSON, Ariz.— Under a settlement with the Center for Biological Diversity and the Animal Welfare Institute approved today in Tucson federal court, the U.S. Department of Agriculture and U.S. Fish and Wildlife Service agreed to conduct analyses aimed at ensuring that Wildlife Services, the department's long-running program that kills Arizona and Texas wildlife, does not inadvertently kill endangered ocelots. Wildlife Services is required by the Endangered Species Act to consult with the Fish and Wildlife Service on its activities that may affect endangered species, including predator control. 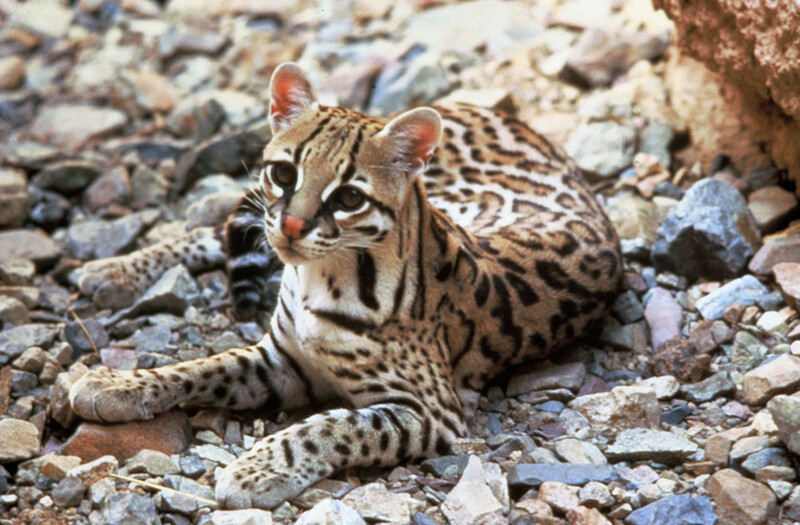 The program kills wildlife within the range of endangered ocelots. Given the similarity in size between ocelots and many of the targeted predators, the Fish and Wildlife Service warned Wildlife Services in a 2010 “biological opinion” document that ocelots could be harmed by its use of traps, snares and poisons — including baited M-44 devices that propel lethal doses of sodium cyanide into animals' mouths. Since that 2010 opinion, ocelots have been spotted in several additional locations in Arizona, including the Huachuca and Santa Rita mountains. New evidence also indicates that Wildlife Services has failed to comply with the mandatory measures intended to minimize risk to ocelots. Since the plaintiff wildlife organizations filed their complaint, Wildlife Services and the Fish and Wildlife Service have been working together to examine risks to ocelots and develop risk-mitigation measures. Under the settlement, the Service's consultation determination is due at the end of June. The wildlife organizations' complaint also asserted that Wildlife Services must use recent science to supplement its outdated, 1990s environmental analyses of its wildlife-killing program in Arizona. Under the settlement the Service will analyze this new information in a final “environmental assessment” to be released by December 29. The Wildlife Services program kills tens of thousands of animals in Arizona and Texas every year using traps, snares and poisons. Texas leads the country in the number of nontarget deaths from M-44 devices, also known as “cyanide bombs,” with 822 bobcats, foxes and other animals unintentionally killed from 2010 to 2016. Ocelots have tawny coats marked by elongated brown spots with black borders. They can weigh as much as 35 pounds and stretch to 4 feet in length (including the tail). Ocelots seem to prefer dense cover but use a variety of habitats. Hunting mostly at night, they target rabbits, birds, fish, rodents, snakes, lizards and other small- to medium-sized prey. Their range includes Texas, Arizona, Mexico and Central and South America. Monitoring of collared individuals has shown that ocelots travel as far as 10 miles outside their home ranges. Since 2009 they've been detected at least five times in Arizona, including a road-killed ocelot near Globe in 2010, a treed ocelot in the Huachuca Mountains in 2011 and a male ocelot photographed in the Santa Rita Mountains in 2014. Since 1982 the species has been designated as “endangered” under the Endangered Species Act. Although never abundant, ocelots were historically killed incidentally during the hunting, trapping and poisoning of coyotes, bobcats and other predators. Habitat loss also contributed to the animals' decline; only a fraction of the less than 5 percent of original native vegetation remaining in the lower Rio Grande Valley is optimal habitat for these cats. Now continuing habitat loss, collisions with vehicles and inbreeding resulting from small and isolated groups are keeping the wildcats' population numbers low. Photo by Tom Symlie, USFWS. This image is available for media use.